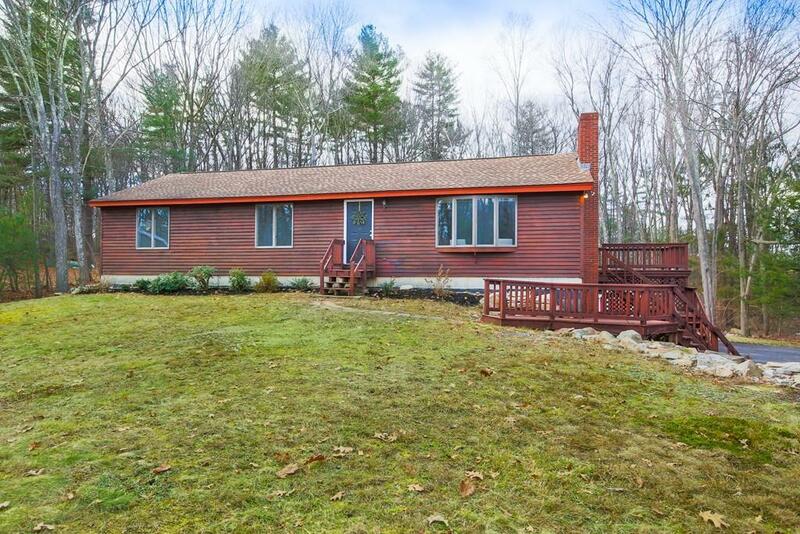 Nature & privacy lovers will be right at home at 77 Woodland Road, a wonderfully updated custom contemporary ranch sited on an acre lot abutting Breakneck Hill conservation land! First floor features an open floor plan with large living room & coat closet, hardwood floors, bay window & cathedral ceiling, dining room w/chandelier & remodeled kitchen w/white cabinets, granite counters, tile floors & stainless steel dishwasher & stove. Off the hallway are storage closets, an updated full bath w/new vanity, flooring & tub/shower. Also, a freshly painted master suite w/large picture window plus new carpet, a double closet & updated full bath. Two additional bedrooms include closets & new carpet. A terrific walk-out lower level includes a fabulous family room w/wood burning stove & new carpet. Plus an office/bonus room w/closet & laundry room w/sink. Additional work room for hobbies & storage room. Large deck, shed, exterior lighting & lovely yard complete the picture. MOVE IN TODAY!